White ink tattoos gain in popularity when Hollywood celebrities and models like Rihanna and Lindsay Lohan began wearing them on their skin. Much like the traditional tattoos, white ink tats are considered as a personal statement although its subtle nature makes it quite difficult to be perceived by the naked eye. 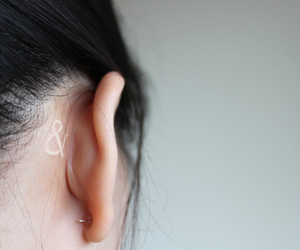 So what keeps white ink tattoo on-trend today? Probably because it is thought to be a unique improvement over the dark ink tats as they look appealing under UV lights, plus the popular belief that receiving white ink is lot more painful than the latter. However, this is considered as a misconception because it’s not that ink that causes body pain but it’s the moment when your endorphins begin to diminish. White ink is the last pigmentation that is applied into the skin during a regular tattoo session. Therefore, in the end the endorphins that help you tolerate the pain that comes with tattooing is depleting making your body more susceptible to receiving pain. What is a White Tattoo Ink? The white pigmentation is made up of a liquid carrier and a pigment, in which it probably contains lead carbonate, rutile and titanium dioxide. The liquid carrier evens out the distribution of the ink as it penetrates the skin. It can also serve as a disinfectant to the pigment so that the tattoo artist can use it safely. The process does not involve the application of stenciling and outlining techniques that are usually applied in executing ordinary tattoos. In white ink tattoo, everything is completed with the white pigment that leaves a ghostly and scar-like image on the body. This is also why experts characterize its appearance as that of excessive branding. The white ink that is used for tattooing is relatively different from the white pigment being used in dark and colored tats. It is rather thicker in texture and mixture yet usually made of quality ink because it is supposed to be striking on its own. Only the skilled and experienced tattoo artists can pull off a well-designed white ink tat. The artist will either use a stencil to ink you with white tattoo or he will do it freehand. Using a stencil requires a higher level of expertise from the artist because it would be quite dangerous if a novice would have done it. An experienced tattooist must be careful in doing his job so that the stencil does not touch the white ink being applied as doing so can dull the luminosity of the ink. 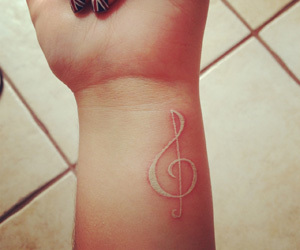 White ink tattoo has its own pros and cons, by which learning them you will be able to make a wise decision on whether to join the bandwagon or not. White ink tattoo is more visible under UV lights, which is a cool attribute. So, if you happen to frequent disco clubs having a white tat ink in your body can make you look more attractive. However, people with freckles or with dark skin complexion should be wary of having white ink tattoo for the results may look bizarre and quite fuzzy. According to professionals, white ink tats don’t last long compared to your ordinary tattoo and when it faded, it will leave your skin somewhat suffering from discoloration and bruises. Some faded white ink would even turn into yellow color or green because of its translucent nature; that whatever color it absorbs it will be stained easily and permanently. This kind of reaction does not happen with dark tattoo ink because such colors (i.e. black, green, blue, etc.) are stronger than the translucent pigment. 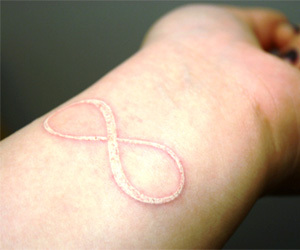 Depending on the design and the manner by which the white tattoo ink is applied into the skin, the tat may end up looking like some kind of a skin disease. To avoid this from happening to you always think twice about the design. Visualize the end-result and get a realistic decision before having that body part of yours inked by a white tattoo ink. Of course, if your skin is allergic to white ink, you should not have it in the first place. If it won’t cause any allergic reaction to your body, then make sure to have it inked in areas of the body that are not exposed to the sun when you are outdoor. The chemical composition of the ink can turn dull when bared to the strong household and weather elements. Overall, white ink tattoo traditionally aids in highlighting the bright colors of the tattoo design by adding depth and light balance to the colors. This is also why it is one of the last pigments to be applied by the artist, meaning to say, it is mainly use for highlighting purposes only. But that was before because as of late it is becoming its own “genre” of tattoo art. To add, it is generally accepted that white ink tattoo looks awesome on people with fair skin complexion the most, but even the dark-skinned Rihanna could pull it off so it depends on the wearer, really. Keep in mind to make a wise decision about it because otherwise you may end up regretting it, or damaging the health condition of your skin.